1. Jemal A, Tiwari RC, Murray T, et al. Cancer statistics 2004. CA Cancer J Clin 2004; 54: 8-29. 2. Seidman JD, Russell P, Kurman RJ. Surface epithelial tumors of the ovary. Blaustein's pathology of the female genital tract. (Kurman RJ, ed. ), New York, Springer Verlag, 2002, pp. 791-904. 3. Scully RE. 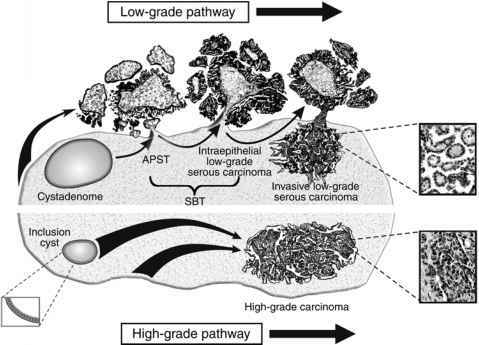 International histological classification of tumors: histological typing of ovarian tumors. World Health Organization, Geneva, 1999. 4. Scully RE. World Health Organization international histological classification of tumours. New York, NY, Springer, 1999. 5. Dubeau L. Ovarian Cancer. The metabolic and molecular bases of inherited disease. (Scriver CR, Beaudet AL, Sly WS, et al., eds. ), McGraw-Hill, 2001, pp. 1091-1096. 6. Berek JS, Martinez-Maza O. Molecular and biologic factors in the pathogenesis of ovarian cancer. J Reprod Med 1994; 39: 241-248. 7. Burks RT, Sherman ME, Kurman RJ. Micropapillary serous carcinoma of the ovary. A distinctive low-grade carcinoma related to serous borderline tumors. Am J Surg Pathol 1996; 20: 1319-1330. 8. Riopel MA, Ronnett BM, Kurman RJ. Evaluation of diagnostic criteria and behavior of ovarian intestinal- type mucinous tumors: atypical proliferative (borderline) tumors and intraepithelial, microinvasive, invasive, and metastatic carcinomas. Am J Surg Pathol 1999; 23: 617-635. 9. Seidman JD, Kurman RJ. Subclassification of serous borderline tumors of the ovary into benign and malignant types. A clinicopathologic study of 65 advanced stage cases. Am J Surg Pathol 1996; 20: 1331-1345. 10. Sehdev AES, Sehdev PS, Kurman RJ. Noninvasive and invasive miropapillary serous carcinoma of the ovary: a clinicopathologic analysis of 135 cases. Am J Surg Pathol 2003; 27: 725-736. 11. Okuda T, Otsuka J, Sekizawa A, et al. p53 mutations and overexpression affect prognosis of ovarian endometrioid cancer but not clear cell cancer. Gynecol Oncol 2003; 88: 318-325. 12. Modesitt SC, Tortolero-Luna G, Robinson JB, Gershenson D, Wolf JK. Ovarian and extraovarian endometriosis-associated cancer. Obstet Gynecol 2002; 100: 788-795. 13. Horiuchi A, Itoh K, Shimizu M, et al. Toward understanding the natural history of ovarian carcinoma development: a clinicopathological approach. Gynecol Oncol 2003; 88: 309-317. 14. Singer G, Kurman RJ, Chang H-W, Cho SKR, Shih I-M. Diverse tumorigenic pathways in ovarian serous carcinoma. Am J Pathol 2002; 160: 1223-1228. 15. Masuda A, Takeda A, Fukami H, Yamada C, Matsuyama M. Characteristics of cell lines established from a mixed mesodermal tumor of the human ovary. Carcinomatous cells are changeable to sarcomatous cells. Cancer 1987; 60: 1697-2703. 16. Moritani S, Moriya T, Kushima R, Sugihara H, Harada M, Hattori T. Ovarian carcinoma recurring as carcinosarcoma. Pathol Int 2001; 51: 380-384. 17. Bell DA, Scully RE. Early de novo ovarian carcinoma. A study of fourteen cases. Cancer 1994; 73: 1859-1864. 18. Peyssonnaux C, Eychene A. The Raf/MEK/ERK pathway: new concepts of activation. Biol Cell 2001; 93: 53-62. 19. Singer G, Oldt R 3rd, Cohen Y, et al. Mutations in BRAF and KRAS characterize the development of low-grade ovarian serous carcinoma. J Natl Cancer Inst 2003; 95: 484-486. 20. Davies H, Bignell GR, Cox C, et al. Mutations of the BRAF gene in human cancer. Nature 2002; 417: 949-954. 21. Rajagopalan H, Bardelli A, Lengauer C, Kinzler KW, Vogelstein B, Velculescu VE. Tumorigenesis: RAF/RAS oncogenes and mismatch-repair status. Nature 2002; 418: 934. 22. Ho C-L, Kurman RJ, Dehari R, Wang T-L, Shih I-M. Mutations of BRAF and KRAS precede the development of ovarian serous borderline tumors. Cancer Res 2004; 64: 6915-6918. 23. Chan W-Y, Cheung K-K, Schorge JO, et al. Bcl-2 and p53 Protein Expression, Apoptosis, and p53 Mutation in Human Epithelial Ovarian Cancers. Am J Pathol 2000; 156: 409-417. 24. Kohler MF, Marks JR, Wiseman RW, et al. Spectrum of mutation and frequency of allelic deletion of the p53 gene in ovarian cancer. J Natl Cancer Inst 1993; 85: 1513-1519. 25. Milner J, Medcalf EA, Cook AC. Tumor suppressor p53: analysis of wild-type and mutant p53 complexes. Mol Cell Biol 1991; 11: 12-19. 26. Kupryjanczyk J, Thor AD, Beauchamp R, et al. p53 gene mutations and protein accumulation in human ovarian cancer. Proc Natl Acad Sci USA 1993; 90: 4961-4965. 27. Berchuck A, Carney M. Human ovarian cancer of the surface epithelium. Biochem Pharmacol 1997; 54: 541-544. 28. Wen WH, Reles A, Runnebaum IB, et al. p53 mutations and expression in ovarian cancers: correlation with overall survival. Int J Gynecol Pathol 1999; 18: 29-41. 29. Shelling AN, Cooke I, Ganesan TS. The genetic analysis of ovarian cancer. Br J Cancer 1995; 72: 521-527. 30. Pothuri B, Leitao M, Barakat R, et al. Genetic analysis of ovarian carcinoma histogenesis. Abstract in Society of Gynecologic Oncologists, 32nd Annual Meeting 2001. Nashville, TN. 31. Gallardo A, Matias-Guiu X, Lagarda H, et al. Malignant mullerian mixed tumor arising from ovarian serous carcinoma: a clinicopathologic and molecular study of two cases. Int J Gynecol Pathol 2002; 21: 268-272. 32. Kounelis S, Jones MW, Papadaki H, Bakker A, Swalsky P, Finkelstein SD. Carcinosarcomas (malignant mixed mullerian tumors) of the female genital tract: comparative molecular analysis of epithelial and mesenchymal components. Hum Pathol 1998; 29: 82-87. 33. Abeln EC, Smit VT, Wessels JW, de Leeuw WJ, Cornelisse CJ, Fleuren GJ. Molecular genetic evidence for the conversion hypothesis of the origin of malignant mixed mullerian tumours. J Pathol 1997; 183: 424-431. 34. Sreenan JJ, Hart WR. Carcinosarcomas of the female genital tract. A pathologic study of 29 metasta-tic tumors: further evidence for the dominant role of the epithelial component and the conversion theory of histogenesis. Am J Surg Pathol 1995; 19: 666-674. 35. Ross JS, Yang F, Kallakury BV, Sheehan CE, Ambros RA, Muraca PJ. HER-2/neu oncogene amplification by fluorescence in situ hybridization in epithelial tumors of the ovary. Am J Clin Pathol 1999; 111: 311-316. 36. Cheng JQ, Godwin AK, Bellacosa A, et al. AKT2, a putative oncogene encoding a member of a subfamily of protein- serine/threonine kinases, is amplified in human ovarian carcinomas. Proc Natl Acad Sci USA 1992; 89: 9267-9271. 37. Bellacosa A, de Feo D, Godwin AK, et al. Molecular alterations of the AKT2 oncogene in ovarian and breast carcinomas. Int J Cancer 1995; 64: 280-285. 38. Shih IM, Sheu J, Santillan A, et al. Amplification of a chromatin remodeling gene, Rsf-1/HBXAP, in ovarian carcinoma. Proc Natl Acad Sci USA 2005; 102: 14,004-14,009. 39. Singer G, Rebmann V, Y-C C, Chen et al. HLA-G is a potential tumor marker in malignant ascites. Clin Cancer Res 2003; 9: 4460-4464. 40. Chen Y-C, Pohl G, Wang T-L, et al. Apolipoprotein E is required for cell proliferation and survival in ovarian cancer. Cancer Res 2005; 65: 331-337. 41. Urosevic M, Kurrer MO, Kamarashev J, et al. Human leukocyte antigen G up-regulation in lung cancer associates with high-grade histology, human leukocyte antigen class I loss and interleukin-10 production. Am J Pathol 2001; 159: 817-824. 42. Urosevic M, Willers J, Mueller B, Kempf W, Burg G, Dummer R. HLA-G protein up-regulation in primary cutaneous lymphomas is associated with interleukin-10 expression in large cell T-cell lymphomas and indolent B-cell lymphomas. Blood 2002; 99: 609-617. 43. Tsuchiya A, Sakamoto M, Yasuda J, et al. Expression profiling in ovarian clear cell carcinoma: identification of hepatocyte nuclear factor-1beta as a molecular marker and a possible molecular target for therapy of ovarian clear cell carcinoma. Am J Pathol 2003; 163: 2503-2512. 44. Hough CD, Sherman-Baust CA, Pizer ES, et al. Large-scale serial analysis of gene expression reveals genes differentially expressed in ovarian cancer. Cancer Res 2000; 60: 6281-6287. 45. Mok SC, Bell DA, Knapp RC, et al. Mutation of K-ras protooncogene in human ovarian epithelial tumors of borderline malignancy. Cancer Res 1993; 53: 1489-1492. 46. Ichikawa Y, Nishida M, Suzuki H. Mutation of KRAS protooncogene is associated iwth histological subtypes in human mucinous ovarian tumors. Cancer Res 1994; 54: 33-35. 47. Enomoto T, Weghorst CM, Inoue M, Tanizawa O, Rice JM. K-ras activation occurs frequently in mucinous adenocarcinomas and rarely in other common epithelial tumors of the human ovary. Am J Pathol 1991; 139: 777-785. 48. Caduff RF, Svoboda-Newman SM, Ferguson AW, Johnston CM, Frank TS. Comparison of mutations of Ki-RAS and p53 immunoreactivity in borderline and malignant epithelial ovarian tumors. Am J Surg Pathol 1999; 23: 323-328. 49. Gemignani ML, Schlaerth AC, Bogomolniy F, et al. Role of KRAS and BRAF gene mutations in mucinous ovarian carcinoma. Gyncol Oncol 2003; 90: 378-381. 50. Wu R, Zhai Y, Fearon ER, Cho KR. Diverse mechanisms of beta-catenin deregulation in ovarian endometrioid adenocarcinomas. Cancer Res 2001; 61: 8247-8255. 51. Moreno-Bueno G, Gamallo C, Perez-Gallego L, deMora JC, Suarez A, Palacios J. beta-Catenin expressionpattern, beta-catenin gene mutations, and microsatellite instability in endometrioid ovarian carcinomas and synchronous endometrial carcinomas. Diagn Mol Pathol 2001; 10: 116-122. 52. Cuatrecasas M, Erill N, Musulen E, Costa I, Matias-Guiu X, Prat J. K-ras mutations in nonmucinous ovarian epithelial tumors: a molecular analysis and clinicopathologic study of 144 patients. Cancer 1998; 82: 1088-1095. 53. Hogdall EV, Hogdall CK, Blaakaer J, et al. K-ras alterations in Danish ovarian tumour patients. From the Danish "Malova" Ovarian Cancer study. Gynecol Oncol 2003; 89: 31-36. 54. Obata K, Morland SJ, Watson RH, et al. Frequent PTEN/MMAC mutations in endometrioid but not serous or mucinous epithelial ovarian tumors. Cancer Res 1998; 58: 2095-2097. 55. Sato N, Tsunoda H, Nishida M, et al. Loss of heterozygosity on 10q23.3 and mutation of the tumor suppressor gene PTEN in benign endometrial cyst of the ovary: possible sequence progression from benign endometrial cyst to endometrioid carcinoma and clear cell carcinoma of the ovary. Cancer Res 2000; 60: 7052-7056. 56. Saito M, Okamoto A, Kohno T, et al. Allelic imbalance and mutations of the PTEN gene in ovarian cancer. Int J Cancer 2000; 85: 160-165. 57. Thomas EJ, Campbell IG. Molecular genetic defects in endometriosis. Gynecol Obstet Invest 2000; 50: 44-50. 58. Obata K, Hoshiai H. Common genetic changes between endometriosis and ovarian cancer. Gynecol Obstet Invest 2000; 50: 39-43. 59. Bischoff FZ, Simpson JL. Heritability and molecular genetic studies of endometriosis. Hum Reprod Update 2000; 6: 37-44. 60. Dinulescu DM, Ince TA, Quade BJ, Shafer SA, Crowley D, Jacks T. Role of K-ras and Pten in the development of mouse models of endometriosis and endometrioid ovarian cancer. Nat Med 2005; 11: 63-70. 61. Francis-Thickpenny KM, Richardson DM, van Ee CC, et al. Analysis of the TGF-beta functional pathway in epithelial ovarian carcinoma. Br J Cancer 2001; 85: 687-691. 62. Fujita M, Enomoto T, Yoshino K, et al. Microsatellite instability and alterations in the hMSH2 gene in human ovarian cancer. Int J Cancer 1995; 64: 361-366. 63. Gras E, Catasus L, Arguelles R, et al. Microsatellite instability, MLH-1 promoter hypermethylation, and frameshipt mutations at coding mononucleotide repeat microstellites in ovarian tumors. Cancer 2001; 92: 2829-2836. 64. Shih I-M, Kurman RJ. Ovarian tumorigenesis- a proposed model based on morphological and molecular genetic analysis. Am J Pathol 2004; 164: 1511-1518. 65. Kinzler KW, Vogelstein B. 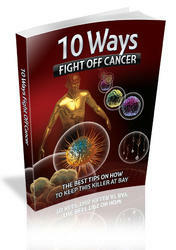 The Genetic Basis of Human Cancer. Toronto, McGraw-Hill, 2002. 66. Shih Ie M, Wang TL. Apply innovative technologies to explore cancer genome. Curr Opin Oncol 2005; 17: 33-38. 67. Berman JJ. Borderline Ovarian Tumor Workshop, Bethesda, Maryland, August 27-28, 2003. Hum Pathol 2004, 35: 907-909. 68. Singer G, Shih Ie M, Truskinovsky A, Umudum H, Kurman RJ. Mutational Analysis of K-ras Segregates Ovarian Serous Carcinomas into Two Types: Invasive MPSC (Low-grade Tumor) and Conventional Serous Carcinoma (High-grade Tumor). Int J Gynecol Pathol 2003; 22: 37-41.